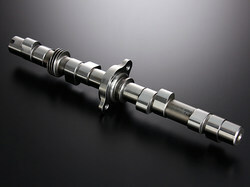 Camshaft -­-­-­-­ the heart of the four-­stroke engine. Yoshimura, which has been leading the world since 1954 in camshaft tuning technology, has triggered an evolution by innovating new method and material. It was a historical accomplishment driven by their spirit and passion. Let’s look closely at Yoshimura’s latest cylinder head tuning. Yoshimura’s camshaft tuning goes back to the days of Pop. Most of the 4-­stroke gasoline engines rely on the cam which operates the intake and exhaust valves with egg-­shaped lobes, and it has been well known that a good cam drastically improves engine performance. In the early days, stock cams were modified by skilled hands. 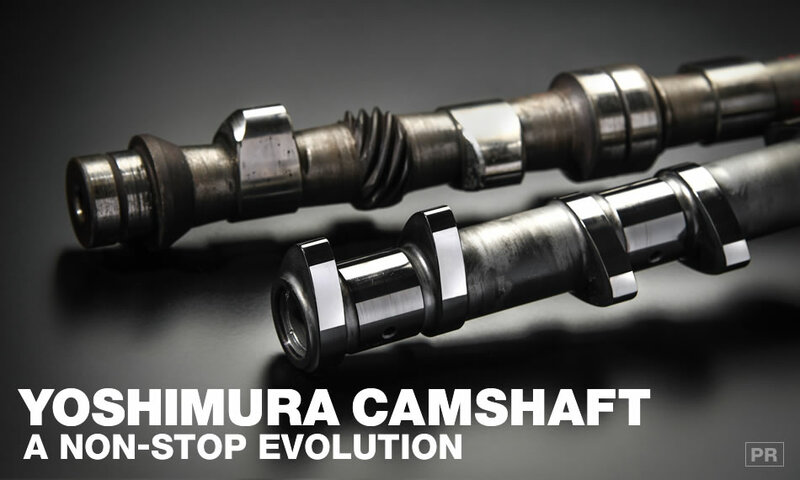 With his hands-­on experience, technical expertise, amazing intuition and craftsmanship, “Pop” Yoshimura used to handcraft various high-­lift cams, either by grinding down the base circle to gain valve lift and duration or by depositing stellite alloy directly onto the lobes. 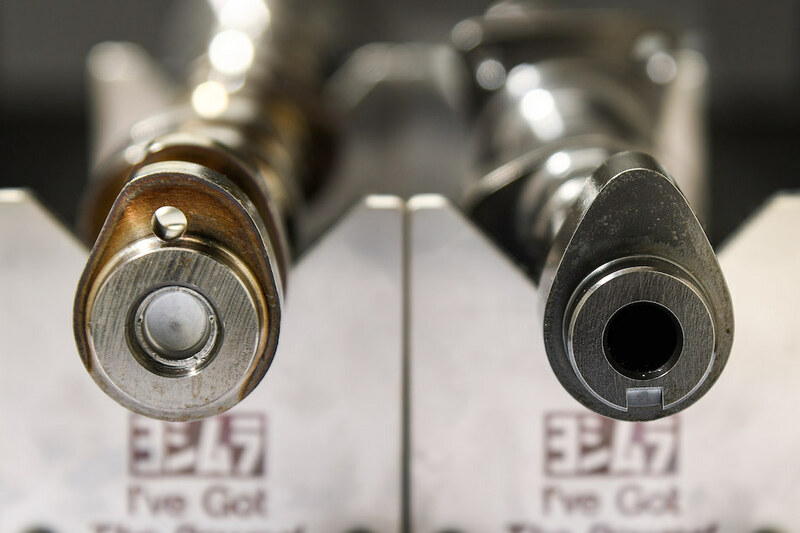 After it became possible to obtain pre-­machined blank camshaft billets, Yoshimura began producing high-­lift, high-­duration cams on a mechanical profiling grinder. Cams were then calibrated, examined and tested on a dyno, before hitting the tracks for further research and development. The son took a different approach. At some point between the late 1970s and early 1980s, Fujio Yoshimura began using a computer to design camshafts and eventually wrote a program for drawing new cam profiles from the valve lift data measured at every degree of camshaft rotation. The first fruit of this program was installed on the Yoshimura Suzuki GS1000S which took the 1st and 2nd place in the 1981 Daytona Superbike race. FY: My father’s intuition and craftsmanship were incredible, but we needed to analyze them and improve the precision. So, I went and bought a Hewlett-­Packard HP-­41C handheld computer and wrote a program from scratch. Computers in those days were indeed not as user friendly as they are today. The 2nd and current President of Yoshimura was born on November 17th, 1948, a son of the tuning genius Hideo “Pop” Yoshimura. As a man of theory, Fujio had succeeded in digitizing his father’s intuition and craftsmanship by means of a computer. It was way ahead of its time in many ways. 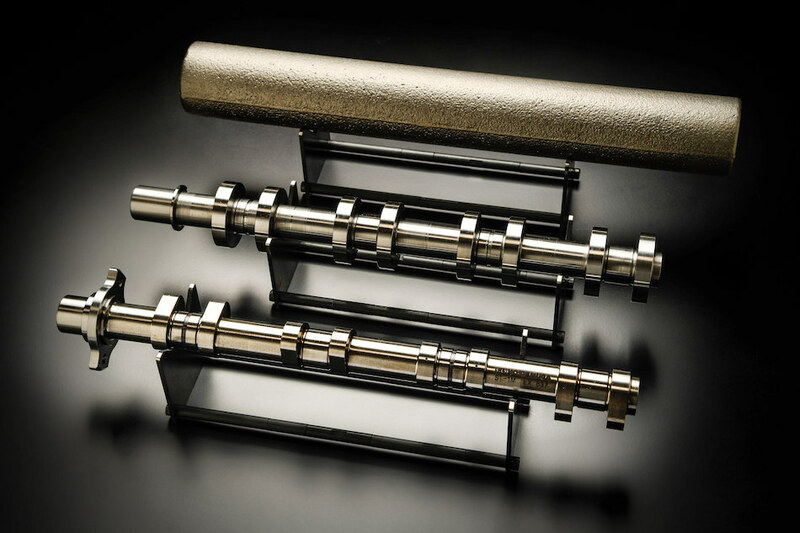 It was the dawn of a new era in camshaft design. The mechanical cam grinder -­-­-­-­ which duplicates the profile of a master cam -­-­-­-­ was then replaced with a CNC (Computer Numerical Control) machine. The master cam was no longer needed. The product precision and production efficiency were dramatically improved. The rocker-­arm's motion was also studied. Thoroughly understanding the mechanical characteristics of rocker-­arm system -­-­-­-­ involving multiple complex variables such as leverage ratio and pad radius -­-­-­-­ was another landmark achievement for Yoshimura. This experience eventually lead to the development of the Desmo type camshaft. A lift curve is a graph correlating the valve lift with crank angle. The horizontal axis represents crank angle, displaying valve opening/closing phase and maximum lift (full-­open) position. As shown in the graph, the maximum lift of Stage 2 cam (red curve) is about 1 mm greater than that of Stage 1 cam (blue curve). Duration is defined as the angle between the valve opening/closing points. There are separate valve lift curves for intake and exhaust, and the valve overlap period can be visualized by plotting the two curves together on the same chart. 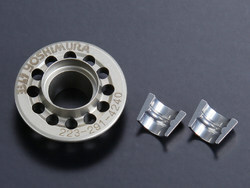 Yoshimura’s cam specs for opening/closing are all measured at 1-­mm of valve lift. However, the cam design was still based on the valve lift curve. Sure, the maximum lift and duration are fundamental factors, but are not the only factors that affect the performance of the valvetrain. What else -­-­-­-­ besides 4-­into-­1 exhaust system -­-­-­-­ will improve the intake and exhaust efficiency? One of the key factors is valve spring. Valve springs can function properly only within the range they are designed for. The valves will float (jump) and become unable to follow the lift curve if they move faster than the reaction of the springs. Nevertheless, installing heavy-­duty valve springs that are too stiff (so-­called “bad” performance valve springs) will increase friction losses. 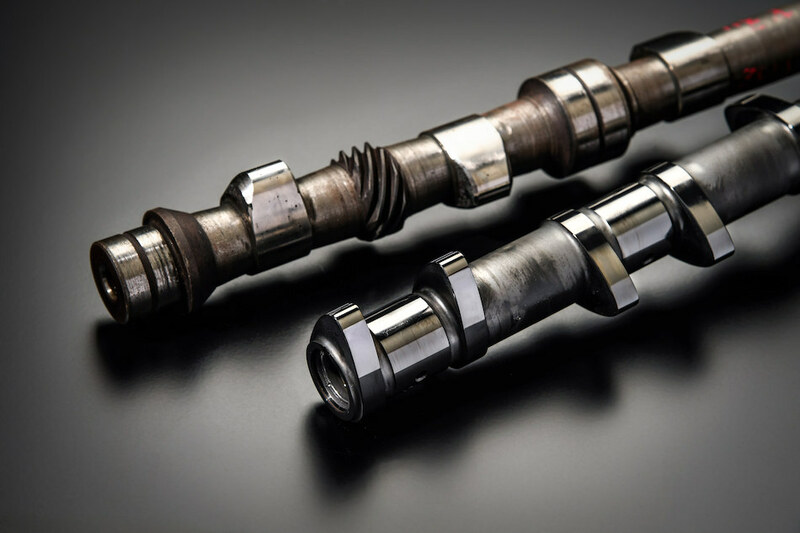 You need to find the perfect balance between camshaft which increases power and valve springs which could be either beneficial or harmful to the engine performance. Graph showing the correlation between the intake/exhaust valve’s sprung mass inertia and the valve spring’s reaction force. The spring force plotted here are of the same valve. Note the similarity of the gaps between the curves of the same color (shown by arrow). The Stage 2 cam (red curve on the top) is also carefully designed not to produce inertia that exceeds the spring force (red curve at the bottom) in order to avoid valve float. This feature eliminates the need for heavy-­duty valve springs, making it possible to get more power out of the stock low-­pressure springs. FY: Valve acceleration was the key factor. We knew it since my father’s time -­-­-­-­ since the early 1970’s -­-­-­-­ but, we just didn't know how to analyze and integrate the data into design back then. Today, it’s different. Hideto is now generating new cam profiles, not from the lift curve but from valve acceleration data. With our new design software, we can now perform high-­precision analysis. HY: When you compare old and new cams side by side, you’ll notice some similarity in the lift curves. But, the acceleration data proves that they are completely different in character. Conventional cams tend to exhibit linear and peaky power characteristics, and therefore you had to choose the right spring with the right tension, maintain the appropriate safety margin and keep the friction as low as possible. Our new generation cams on the other hand, feature much smoother power development. The new cam profile is a continuous curve and not a series of arcs of various radii. The 2nd son of Fujio, who was born on August 2nd, 1986. The young engineer has been designing camshaft profiles from valve acceleration data and is regarded as a leader of the new era of 4-­stroke engine tuning. Yoshimura’s new generation camshaft is designed entirely using computer programs and through analyzing valve acceleration data. It’s a reverse-­thinking approach. The weak points of the lift curve become immediately obvious when the data (collected throughout the rev-­range) are plotted on a graph of valve acceleration versus cam angle. Following the final decision, the ideal lift curve will be converted into a profile data with CAD, which then will be exported into a CNC camshaft grinder for precision machining. FY: Our CNC production process requires certain know-­how for optimal results. It’s one of their best kept secrets. 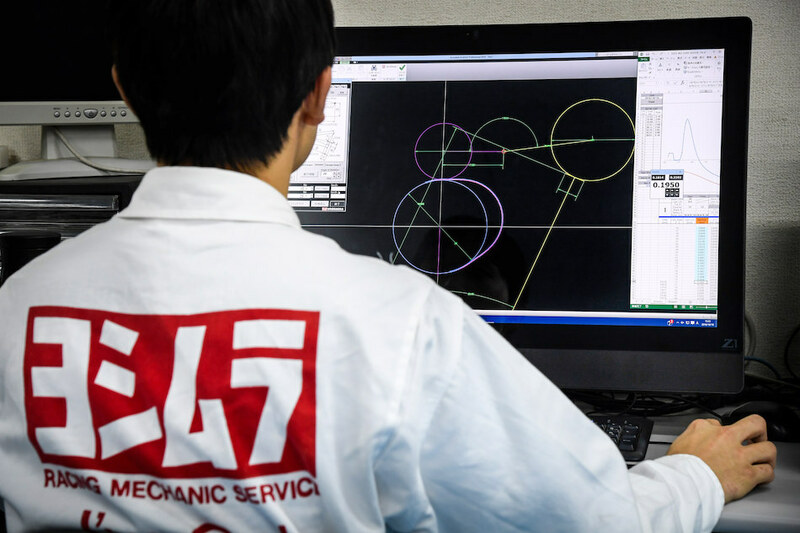 Yoshimura’s experiences, collected data and cutting-­edge technology are fully integrated into the design and production process. Hideto showed us the analysis of the contact force between cam and rocker-­arm (or tappet). When idling, the contact force is very large at the maximum lift point. As the rev goes up, the force at the maximum lift point decreases while the force at the valve opening/closing points increases, because of the influences of the cam inertia. 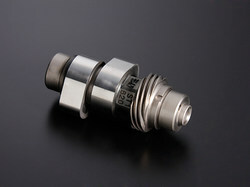 It shows how harmful idling is to both camshaft and valvetrain. Remember to keep the rev’s up a little -­-­-­-­ to reduce the contact force -­-­-­-­ when warming up. The horizontal axis displays cam angle with the top position at zero. When idling, the highest contact force is generated at the top position (the peak of the lobe). The relatively high speed of slippage (the speed of contact point) tends to cause an insufficiency of oil film, which consequently leads to cam scuffing. As the rev goes up, the contact force at the top position decreases. 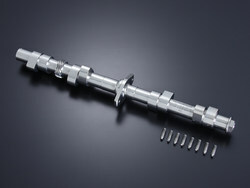 This is caused by the large inertial force of the camshaft rotating at a faster rate. By the time when the engine reaches the rev limit, the contact force at the valve opening/closing points becomes higher than that at the top position. The relatively low speed of slippage at the beginning of the lift assures that the lubrication is adequate (the oil film will be maintained). HY: Race cams have these radically sharp lobes. These are also designed with factors such as valve acceleration, contact force and desired rev range in mind. FY: We also developed new material for the project. It’s a new type of ductile cast iron, containing high amount of graphite particles -­-­-­-­ with high uniformity -­-­-­-­ for improved self-­lubricating properties. It is far superior than the conventional material from which stock cast cams are made. Cast iron has an excellent anti-­scuffing property and that’s why it has been the standard. We had made cams out of extremely rigid SCM (Chrome-­Molybdenum Composite Steel), because blank cams can be hard to come by for some older bikes, but cam scuffing was always a concern. So, we made our own material for making camshafts. They come in rods, and are ready to be machined on CNC machines. 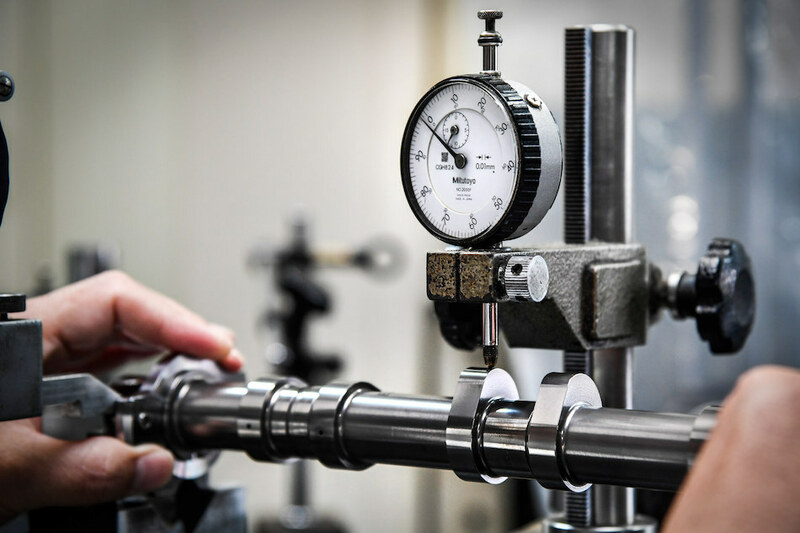 Now we can produce camshafts for all sorts of bikes, including classic bikes and the rocker-­arm bikes (such as ZRX and GPZ900R) with cams which tend to get scuffed easily. You name it. HY: The new generation cams with new profiles should also last longer, since they are redesigned with valve acceleration in mind. FY: However, we will continue using SCM material for racing applications. Cam scuffing is not an issue here since race bikes stay on high rev. 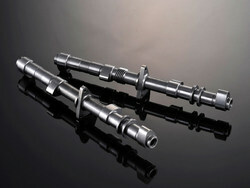 We also do DLC (Diamond-­Like Carbon) coating on cams and rocker-­arms. It’s great that we can now choose various types of material according to the applications. 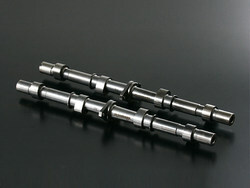 Thus, Yoshimura now has a new method and a new material for producing camshafts. We are witnessing an evolution of the heart of the 4-­stroke engine. What comes next? I do not know, but for sure it will be another breakthrough. With passion towards the future, three generations of Yoshimuras continue to run the family business of tuning 4-stroke engines. 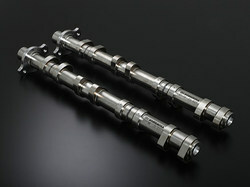 Camshafts for DOHC engines;; rocker-­arm type (on the Left) and direct-­acting type (on the right). The rocker-­arm type has an asymmetric lobe profile, since the angle and contact point of the rocker-­arm changes in relation to valve movement. This geometric effect is generally known as “lever ratio” and it varies as the camshaft rotates. If you have 8mm cam-­lobe lift and 10mm valve lift, then your lever ratio is 1.25. Analyzing the motion of a rocker-­arm mechanism. Even the smallest detail of tappet adjuster screw on the end of the rocker-­arm cannot be ignored. The latest billet cam kit for classic CB750’s contains optional tappet adjuster screws that are designed for optimal leverage ratio. Displaying the 3 stages of the billet-­cam production process. From back to front: a ductile cast iron rod, a product halfway done and a final product (both are for ZRX1100). 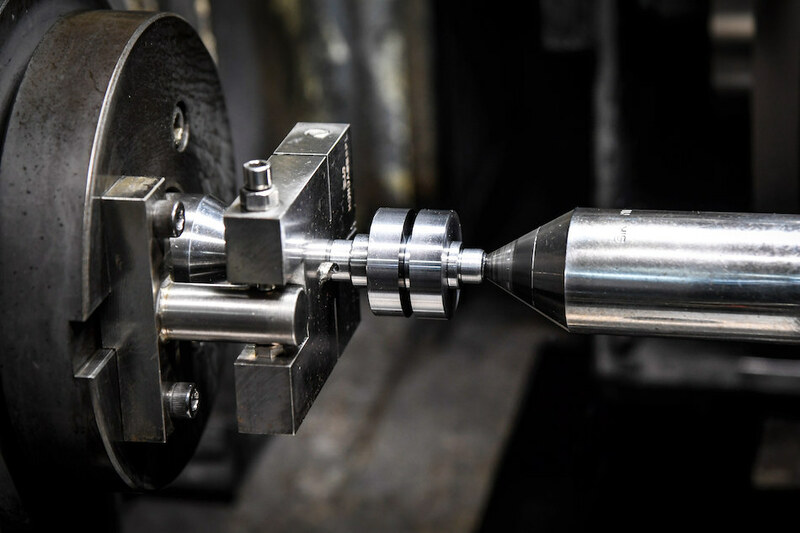 The billet-­cam made from the new material undergoes laser heat treatment (laser surface hardening treatment) which is also a new technology. SCM cam follows the same process, but through different treatments and It takes more time. 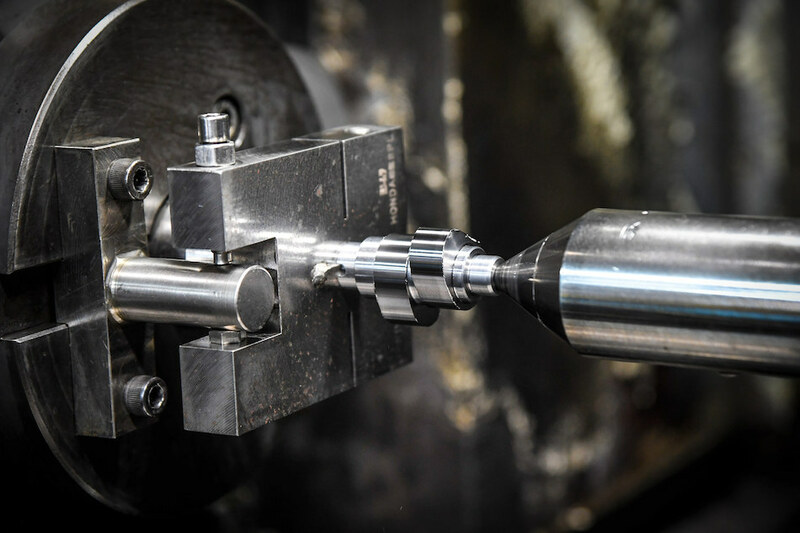 A workpiece on a high-­speed CNC camshaft grinder, waiting for data input. This one is for Honda Ape. Completed cam lobes exposing super clean surface. The grinding process took about 10 minutes. 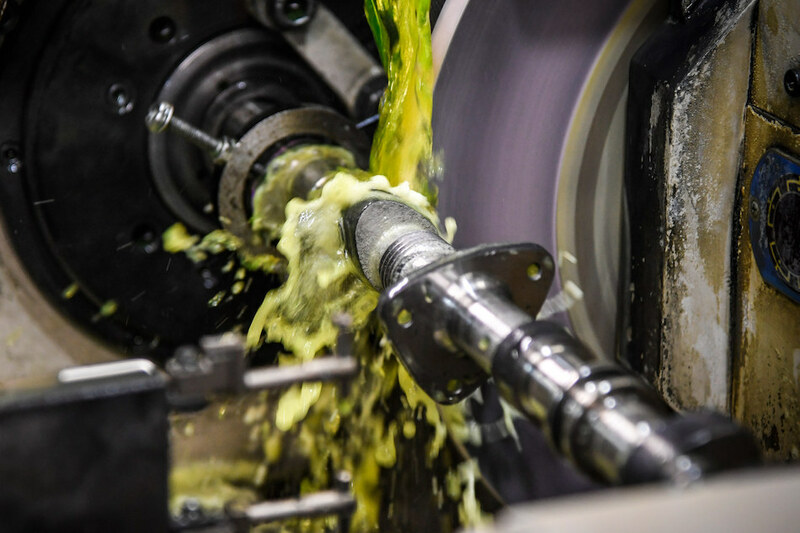 Grinding disk being applied to the journals of a Kawasaki Z1 & Z2 cam. Making a precise measurement before press-­fitting a sprocket (cam gear). A CNC machined cam (front) being compared to an old handmade high-­lift cam for Honda S800 (back) which produced 128hp. They may look different but are based on the same tuning method and philosophy. 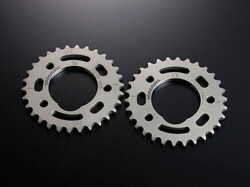 The well-­respected Japanese racing constructor / aftermarket parts manufacturer & supplier, started its business in 1954. The company has been racing and tuning Suzuki motorcycles since the late 1970′s following the years of dedication to Honda and Kawasaki.Their product development, however, is targeting diverse applications ranging from 4-­stroke minis to supersports of various brands.